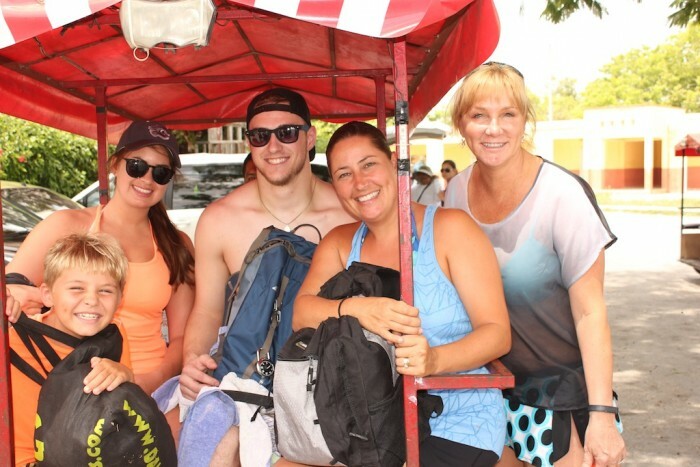 With our out of town guests, we always like to take them over to the quaint little town of Homun in the Yucatan to experience some of the local cenotes and grutas. Cenotes are the fresh water pools that are found all over the Yucatan and are a very refreshing change to salt water and chlorinated pools. Grutas are caves which wind their way throughout the stone in the area. Sometimes you can find a cenote in the back of grutas which is very nice and refreshing! When you drive to Homun, you actually drive past the cenotes in Cuzama, which are also very nice but a little more commercial than we like. In Homun, you pull over and chat with one of the individuals on their bici-moto and arrange for the days tours. They will show you pictures of the cenotes they want to take you to and you decided if you want to do 3, 4, 5, or 6 locations before they bring you to a restaurant for some local Poc-Chuc for dinner. Spencer and Jan from Calgary were in for a treat! We went to 5 different cenotes and enjoyed all of them. From swinging ropes to diving platforms 2.5 meters above the water – we had lots of options for relaxing. Ooops, sorry Senorita Sonya, I almost forgot that we had adopted you as well for the tours and events of the week. The cost of each of the carts, which held 4 people, was 250 pesos. There is also a price at each of the cenotes, many of them family owned and operated, which was 20 pesos. If there were more lights underground, then it may be 25 pesos. We chose to come home after and Lyn made her famous stuffed poblano peppers so we did not experience the poc-chuc this day.